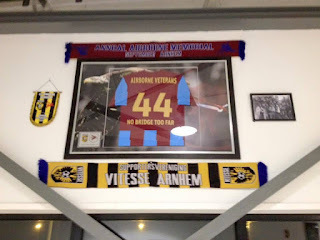 Stichting Betaald Voetbal Vitesse, or simply Vitesse are they are more commonly known is a professional football club from the city of Arnhem in Holland, who were formed on the 14th May 1892. Vitesse were originally formed as a cricket club like several other sporting organisations in the Netherlands at the time. At the meeting to form the club on Parkstraat the founder members, including Mr. Frits Couvée had to decide on a name. They decided upon the French ‘Vitesse’, which read ‘Speed’ after translation. Before too long it was decided to add football to the club’s portfolio. They played their games at Arnhemsche Rink, which offered all year round opportunities. Cricket was played in the summer, football in the winter, with skating taking over when the area flooded and froze. Willem Hesselink was amongst the team in the first ever match against fellow cricket and football club Quick of Nijmegen. 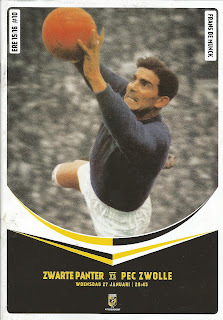 He would become the first Vitesse player to be capped by Holland, to capitalise on his cannonball shooting. After playing friendly games, Vitesse joined the Dutch FA (KNVB) in 1894 to play in the Gelderland Championship. A new home ground was found at Paaschwei, with the team going on to lift the Gelderland title at the first attempt. After another title was added, Vitesse moved to the higher ranked Eerste klasse. Further titles followed in 1896-97 and 1897-98. On both occasions the team reached the Dutch championship decider, but were denied on both occasions by RAP Amsterdam. In 1896 the club moved to a new ground. Matches were played at the velodrome at Klarenbeek. At the turn of the century Vitesse jettisoned their blue and white club colours and opted for yellow and black instead. In 1902-03 Vitesse once again ended as Dutch runners-up, this time to HVV. More Gelderland titles followed, but the national title was proving a step too far. In 1912-13 it was Sparta Rotterdam who denied the club. 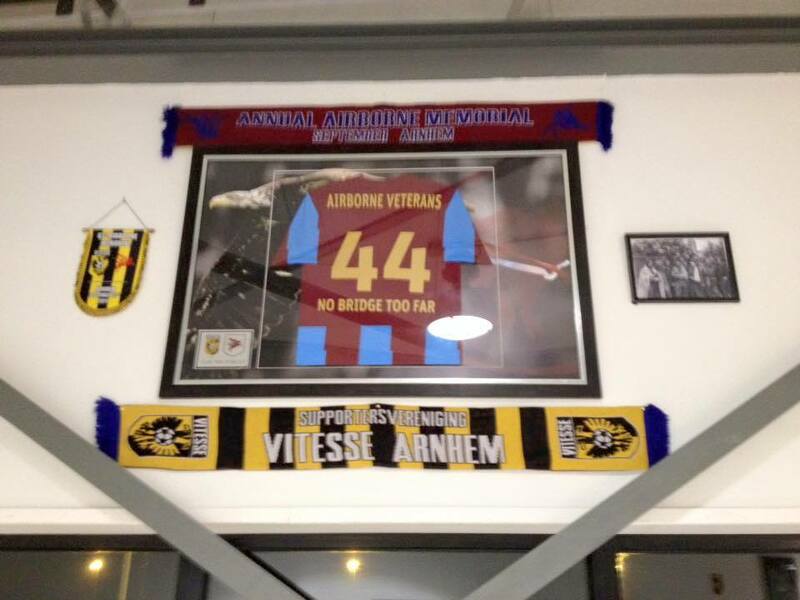 HVV once again would deny Vitesse the following season before Sparta once again broke the hearts of the Arnhem club in 1914-15. The team also reached the KNVB Cup Final of 1912, but they lost out 2-0 to Haarlem. During the period, goalkeeper Just Göbel would prove to be one of Vitesse’s greatest servants, as well as winning twenty two caps for the Dutch national side. The club left Klarenbeek to a new home at Oud Monnikenhuize in 1915. The new ground was opened on the 26th September with a game against Noordelijk Zwaluwen. Following a quiet period honours wise; Vitesse reached the 1927 KNVB Cup Final, where they were defeated 2-0 by VUC Den Haag in Arnhem. From 1914 to 1927 Vitesse had relied on English head coaches; John Sutcliffe, John MacPherson, Charles Griffith and Robert Jefferson. In 1927 the club turned to the German Heinrich Schwarz to lead the club for the next nine years. The team suffered a relegation, but an immediate return via a championship during the 1930’s before World War Two broke out. During the years of conflict Vitesse lifted a league crown along with a record 11-0 victory over Aalten, where Nico Westdijk scored a triple hat trick! In 1942 the club celebrated their fiftieth anniversary with a match against Ajax, while collecting another championship, but no promotion. During the terrible Battle of Arnhem in 1944 the clubhouse was destroyed as well as other great damage to the pitches at Oud Monnikenhuize. The 1945-46 season saw promotion from Tweede klasse Oost to Eerste klasse, but the team were soon relegated once more. Coach Jan Zonnenberg led the team to another title in 1949-50. 1950 saw the club move across Monnikensteeg to new stadium named Stadion Nieuw Monnikenhuize, which was opened on the 3rd September with a 2-1 victory over Feyenoord. In 1952-53 the club lifted their first Eerste klasse championship for thirty five years, before football turned professional in Holland. Many players departed to play for De Graafschap, while new coach Pepi Gruber added many young players to the squad. 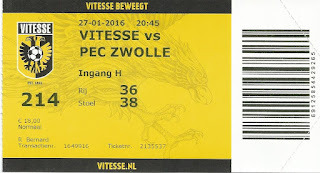 Vitesse embraced the semi-professional era and competed in the second tier Erste Divisie. In 1962 the club dropped down a league, but they regained their spot in 1966. A merger of ADO and Holland Sport freed up a spare place in the top flight Eredivisie for the 1971-72 season. Unfortunately, Cor Brom’s side finished bottom and were relegated back to the Erste Divisie. Henk Wullems took the side back to Eredivisie in 1976-77, where they remained for three seasons. It would be the 1988-89 campaign that saw Vitesse return to the elite league under Bert Jacobs. The team remained in the top flight and reached the 1990 KNVB Cup Final before going down to a solitary goal against PSV at De Kuip, with the goals of John van den Brom propelling the side forward. Some quality players appeared for Vitesse over the next few years, including Hans Gillhaus, Roy Makaay, Nikos Machlas, Sander Westerveld, Philip Cocu and Pierre van Hooijdonk as several coaches took control of team affairs. Nieuw Monnikenhuize saw its last action on the 21st of December 1997, as Vitesse defeated FC Twente 2-1. 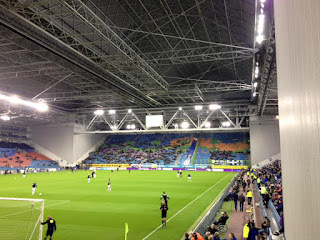 The land was used for new housing while the club moved to the newly built revolutionary GelreDome with its sliding roof and removable pitch. 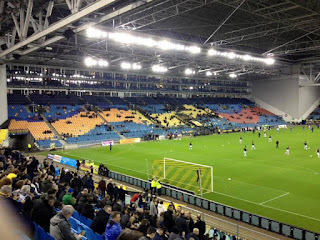 The stadium was the brainchild of club President Karel Aalbers who had been appointed in 1984 with the aim of transforming Vitesse from a second tier Dutch club into one of the top forty in Europe. The GelreDome was able to stage concerts and other events, while attendances rocketed. Aalbers remained in his position until 2000 when the main sponsors Nuon threatened to withdraw their support if he didn’t resign because they were a public utility company owned by the local authorities. They claimed that they were struggling to justify their support for Aalbers ambitious plans. With a couple of years the club began to show a financial deficit. 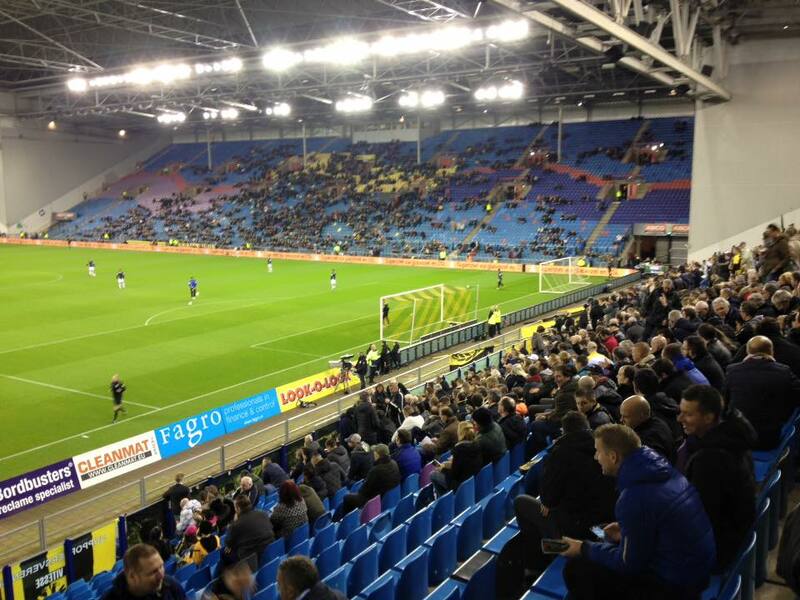 By 2008 Vitesse were threatened with bankruptcy, such was the downturn. Help was at hand when Georgian businessman Merab Jordania bought Vitesse in 2010. Jordania was a close friend of Chelsea owner Roman Abramovich, which led to a partnership between the two clubs. Ronald Koeman was appointed as coach and he had the benefit of loan signing Nemanja Matić from Chelsea. Future coaches Fred Rutten and then Peter Bosz from his appointment in July 2013 had the benefit of further Chelsea loan signings Gaël Kakuta, Patrick van Aanholt and Bertrand Traoré, while Wilfried Bony fired in the goals between 2011 and 2013 before moving on to Swansea City. Vitesse will play in Eredivisie in the 2015-16 season. I arrived in the historic city of Arnhem around 2pm feeling tired and needing some rest after the previous Australia Day shenanigans back in Amsterdam in the excellent company of Dave Kenwery. Fortunately for me the Hotel Arnhem Central was just that, being only a couple of hundred yards from the railway station. Following a decent siesta it was time to have a look around. The night was drawing in rapidly, so seeing too much wasn’t really an option. I’d hear many good things about the welcome offered to Britons because of events in the War. I would have liked to pay proper respect to the past, but time was simply against me. A pleasant walk took me through the narrow streets of the old centre, passing the Pegasus pub that my mate Guy Watson had recommended to me. It was empty at the time and I wasn’t quite ready for beer until I’d had some food. I’m afraid that chicken at Burger King was as adventurous as it got before I searched out the Koren Markt area for some refreshment. Initially I tentatively got back on the horse in Café de Schoof. They seemed a strange all male crowd in there, and I felt like I was being stared at. The piped music was average and too loud. I opted for a change after a couple and I’m glad I did. Café t’ Huys was a far better choice. The fine Jan Hertog beer was only €2.50 a go and it hit the spot, as did some ACDC on the speakers. 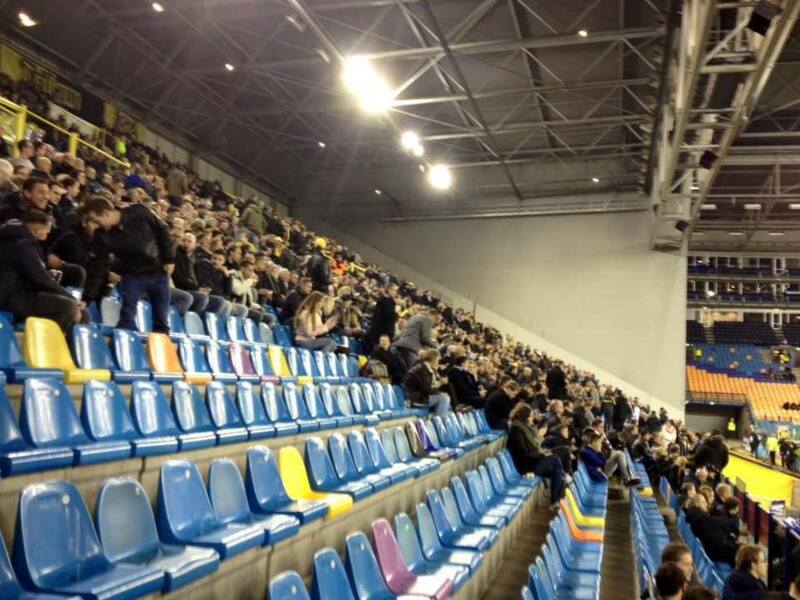 TV’s were showing the early kick off between Vitesse’s local rivals NEC who were playing Twente. 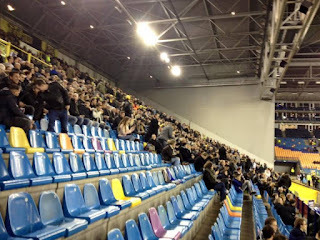 Several Vitesse fans were amongst the vibrant crowd in the bar. It was soon time to walk over to the railway station, where the bus terminus was attached. I followed the crowd of football fans round to the far side and purchased a €4.50 return ticket on the special match buses as the GelreDome was quite some way out of town. The bus only took around ten minutes before it was dropping us off outside the Main Stand. My €18 ticket was for the far corner, which normally would mean a little walk. However, because of the design of the arena it was twice as long. The area behind the South Stand was where the pitch is rolled out when not in use and was fenced off. The bonus came when I got the opportunity to have a quick look inside the supporters clubhouse around that side. It was nice to see reminders of the allied War effort adorning a wall. It was also nice to pick up a free match programme. My seat was high up towards the corner of the stand. It gave me a great view of what was a really cleverly designed arena. Three stands were virtually identical, save for the East where pillars held up the roof at the rear. The final Business Main Stand had rows of corporate boxes at the rear and a section of seating in front. The corners were blocked off with high white walls. With the permanent roof it seemed quite strange, but a perfect template for a club of such a size. Once I discovered that I could walk round to the Business Stand along the concourse I needed no second invitation. The arena was by no means full, so I had a pick of seats. The stewards didn’t seem bothered. One design feature that I wasn’t keen on was when sitting towards the goal, you had no idea of atmosphere or crowd immediately to your right or left because of the corner walls. Before kick off the Arnhem eagle was let loose to show us its skills as it landed right back with its handler. To see the teams come out to the accompaniment of a bit of Status Quo, click here. Vitesse started off the game very positively. Nineteen year old forward Isaiah Brown, who was on loan from Chelsea looked a fine prospect. Visiting keeper Mickey van der Hart pulled off a couple of stops. Brown was finding a willing ally in the Israeli Sheran Yeini. Gradually Zwolle began to get into the game. I’d been tipped off about their centre forward Lars Veldwijk who was on loan from Nottingham Forest by Craig Trapps. He’d called it right, as the big man purveyed some fine hold up play. On around the half hour mark Veldwijk broke through to latch onto a pass. As he was about to shoot inside the area he was unceremoniously hauled down by Vitesse stopper Maikel van der Werff, who formerly played for PEC. Everyone looked for referee Ed Jannsen to point to the penalty spot and produce a red card, but amazingly he waived away all appeals and let play continue. It’s fair to say that Veldwijk was not impressed! A few minutes later appeals for a penalty for handball at the other end also fell on deaf ears. It was refreshing when watching the highlights package back in the UK to hear that Mr Jannsen admitted to getting both decisions wrong. This was a shame as apart from that I thought he was pretty good. At the break I swapped seats to move to the other end of the stand, to where Zwolle hoped to be attacking. They were being backed by a couple of hundred fans. 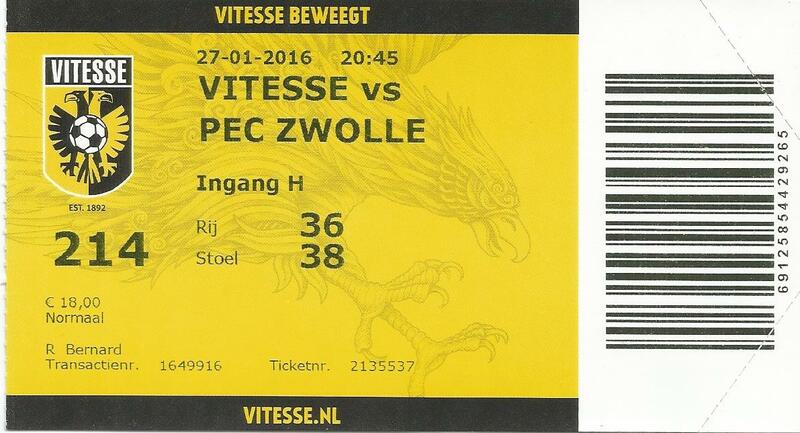 Strangely enough when I went to a game at PEC, their opponents had been Vitesse. I didn’t bother with any refreshments as munten (token) system was in operation. PEC’s defender Dirk Marcellis had an effort punched away by the home custodian Eloy Room soon after the restart. Van der Hart stopped an effort from Vitesse’s Kōsuke Ōta. Although there hadn’t been a goal, the game was entertaining enough and light years ahead of the Ajax v Heracles game the previous evening. 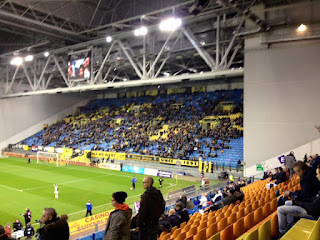 As the volume grew Vitesse took the lead in slightly fortuitous circumstances when Renato Ibarra fired in a low cross, which was diverted into his own net by the PEC left back Bram van Polen on sixty five minutes. It took Zwolle just three minutes to restore parity as Sheraldo Becker set up Dirk Marcellis to stab home into the corner. Both teams continued to try and win the game, but there would be no further scoring. A draw was about fair and I’d enjoyed the game; not least watching it in nice temperatures. There was method in my seat selection for the second half. I was straight down the steps and across the car park to the first bus back to the station. Within twenty minutes of the game finishing I was back in the Café t’ Huys watching the goals from the evening’s other games. While drinking I could see a customer was becoming quite anxious looking for a jacket. Mine was hung up by the wall while I sat at the bar. The barman started to look too and then he came to speak to me. I said that I was English and it was like a new world opened up. The coat was eventually found while I had a good friendly conversation with the barman. He seemed shocked that I’d wanted to visit Arnhem for a game. He thought that the GelreDome was too big for a club of Vitesse’s size. We both agreed that it seemed strange that no other medium sized club around Europe had copied such a model? It was also nice to hear that many Briton's visited the city in respect of former battles. After a few more glasses of beer I went on my way. Arnhem seemed a sleepy type of town on a week night and so it proved when I looked for a snack before bed. Nowhere was open. Instead I had a good nights sleep and got up early for breakfast and then the train to Rotterdam for some more adventures.